WILLEMSTAD - The VanEps Kunneman VanDoorne Thesis Prize of this year was won by Lydia Davelaar. 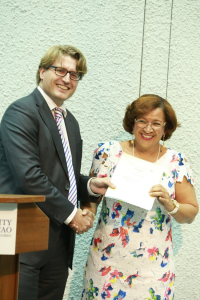 The prize for the best graduation thesis from students at the Faculty of Law of the University of Curaçao was awarded by lawyer Rogier van den Heuvel on Monday, June 22. Davelaar won the 15th edition of the VanEps Kunneman VanDoorne Thesis Prize for her thesis entitled “Statutory settlement according to the new law of succession: a solution for vacant houses in Curacao?”. In her thesis, Davelaar explains that there are many vacant houses in Curacao, for example because the owner passed away and the heirs are unknown. She describes a clear solution for this problem by having the court appoint a legal administrator of the estate to which the house belongs under the new law of succession introduced in 2012.